We’ve selected a winner for JUMP’s fourth annual #HolidaysInJapan photo contest. Thank you to all of our JUMP members who shared their pictures with us this year. As always, we were impressed by the quality of the entries. Japan looks great when viewed through the lenses of our American members. This year’s winning entry came from Jeff Pastwick, shared with us via his Instagram profile, the_travelin_expat. Pastwick is an active duty Navy Warrant Officer, stationed in Yokosuka. He and his wife live in Ikego. 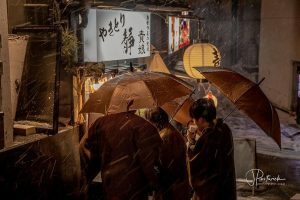 Pastwick took the winning photo in Kusatsu Onsen town in front of a yakitori stand during the first week of January. Here’s how he described the scene: “It could be titled ‘last call’ because it was cold and snowing and the stand was about to close. Everyone was huddled around trying to stay warm and get their last orders in.” As his prize, Pastwick will receive a gift basket valued at $100 in goodies. We also selected two runner-up entries. 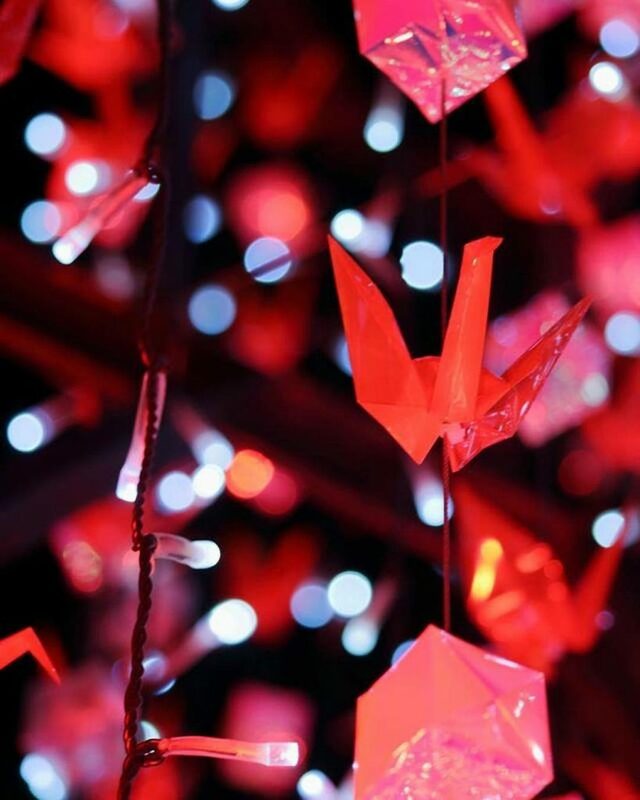 Evelyn Espinoza, a military spouse who lives on Yokota Air Base, entered the striking image below of folded red cranes she shot while visiting the Tokyo City Dome Winter Illuminations with an Edo Japanese theme. She shared the image with us via her Instagram account, evelyncurryart. She is an artist who uses photography as a medium for her artwork. She creates digital photo montages and also paints in oil and watercolor, using her photos as inspiration. 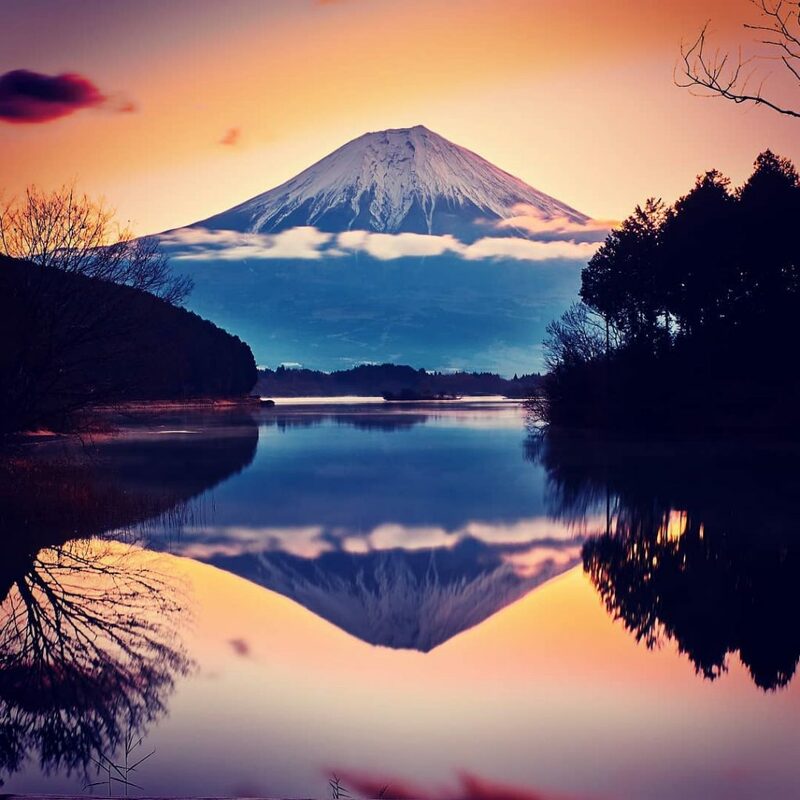 Joni Abando submitted a stunning image of Mt. Fuji frosted with snow on Christmas 2018. Abando is active duty, living in Zama and serving at Yokosuka. Abando shared the story behind her shot: “I have always love taking photos of Mt. Fuji. This was taken the morning of Christmas 2018 at Lake Tanuki. I drove up on Dec 24 and took photos of the mountain from Lake Yamanaka, Lake Kawaguchi, Lake Motosu, and finally this shot was at Lake Tanuki. I stayed overnight, slept in my car, and did not mind the freezing temp early in the morning to get a wonderful view and beautiful shot of Mt. Fuji on Christmas.” Photography is a hobby for Abando. We appreciated seeing all the submitted photos and have selected a few of our favorites out of the more than 50 entries this year for our gallery. Thank you to everyone who sent in entries!